Hey Everyone! So back in March we had some filming in and around our building in Hatton Garden. They mainly directed their cameras on our melting process, and we were told they would like to film the full gold cycle. So, from an item of jewellery being brought, and then sold to us and eventually being melted along with hundreds of other items in our melt bars. The show is called Diamond Geezers and Gold Dealers and allows a view into the world and workings of Hatton Garden. We don’t know too much about the final showcase, but we are excited to see the different characters in the Garden on the silver screen! We are excited to see the finishing film all put together! The guys that were filming were all so happy and excited to have exclusive access to our melt room for filming! And all dressed in their hazard outfits with safety goggles we hope they had a great time experiencing the gold melting process. Let’s hope its a success for tonight’s big showcase! So make sure you guys are all tuned in for a glimpse into our world at HGM!! It’s called Diamond Geezers and Gold Dealers, and its airing tonight, Thursday 24th July- at 9pm on ITV1. We’ve got some lovely full sovereigns on our tray today and we simply couldn’t resist sharing some pictures with you. The full gold sovereign is probably the most popular coin we sell here at Hatton Garden Metals. The full sovereign always carry the British design and its status as legal tender in the UK makes it exempt from Capital Gains Tax (CGT). The sovereigns we have in stock today range from the shiny 2013 Elizabeth II to later dates such as 1922 Georges, 1892 Victoria’s and 1880. We also have a new coin site launching soon, so be sure to keep checking out www.hattongardenmetals.com for the latest updates and competitive prices on full gold sovereigns. The beautifully detailed Gold Eagle, available online now. 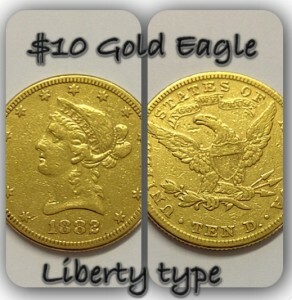 The $10 Gold Eagle was designed by Christian Gobrecht and is well known for its beautiful detail. Referred to as the liberty type, the reverse of the coin is an Eagle with spread wings under a ribbon which states the words ‘In God We Trust’. The obverse of the coin has the bust of Lady Liberty with 13 stars around the edge of the coin. With a fineness of .900 and containing .4838 troy ounces this is a lovely coin to have as part of any collection. Hatton Garden Metals have already been recognised for a number of years as one of the highest payers for scrap gold are now bringing you even more to ensure you are getting the UK’s best price for scrap gold. 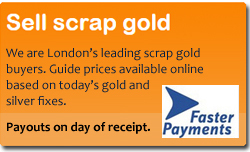 Until the end of May you can get even more for your scrap gold, using the voucher code ‘BESTPRICE’ and Hatton Garden Metals will pay you even more to ensure you are getting the best price for scrap gold from any established reputable UK company. Found a better price? Then call us now on 0207 404 4000 and let us know, we’ll do everything we can to beat any genuine price. Hatton Garden Metals are pleased to announce another great special offer when it comes to selling your gold coins. With immediate effect, and through the month of February we are buying the full gold sovereign at a new market leading rate – 100%. Yes, we are now paying 100% of the market gold fix for the Full Gold Sovereign. Current market conditions mean that the full gold sovereign is in high demand and unlike others we lead the market by passing the benefits of this onto you. This full gold sovereign special offer runs until the end of February, and during this period we will continue to pay 100% of the gold fix for the full gold sovereign regardless of stock levels. This fantastic rate for the full gold sovereign we believe is unrivaled by any major company in the UK. To learn more about our full gold Sovereign special offer read on……. Not only are we buying in the Full Gold Sovereign at 100% of the London Gold Fix, but despite high demand we are also maintaining our sale price for the full gold sovereign at only 3% over the gold fix. This allows you to trade physical full gold Sovereign coins for a spread of only 3%. What’s more, unlike many of our competitors, the full gold sovereign is not subject to any minimum order quantity. We are happy to accommodate all purchases, and maintain the same competitive price for the full gold Sovereign to all our customers, meaning that you can take advantage of purchases and sales of the full gold sovereign coin at one of our lowest spreads on physical gold. Here at Hatton Garden Metals, we are constantly evolving our service to find ways to maximise value for our customers. A large proportion of our investors are swaying towards the full gold Sovereign when looking to hold physical gold. The full gold sovereign is not only favoured merely for the history they hold, but also for their status as a ‘Coin of the Realm’. It is this prestigious title that grants the Full Gold Sovereign exemption from Capital Gains Tax. This is why we hope that by reducing the spread on our Full Gold Sovereigns, our customers will be able to maximise their potential return from investments on the full gold sovereign. To take advantage of this great offer on the full gold Sovereign click here now. 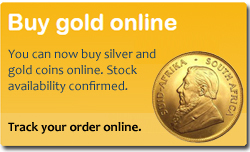 Did you know you can be amongst the first to hear when full gold sovereign stock is added to our online store? You can also be updated with the latest full gold sovereign prices? We have a range of innovative ways for you to stay connected to the latest moves in the market both through our RSS Feeds and through our Investment Twitter account. Why not subscribe today for receive full gold sovereign updates and get yourself ahead of the crowd? The Full Gold Sovereign offer will run until the end of February 2013 for all undamaged full gold Sovereigns as determined by Hatton Garden Metals (HGM). HGM reserve the right to buy any Full Gold Sovereigns that are damaged beyond normal wear and tear at the standard 22ct rate. Please leave any questions you have about the full gold Sovereign special offer below. Dating back to the 14th century, Hallmarking is one of the oldest forms of consumer protection known in the UK. Hallmarking was introduced by King Edward I, and the name Hallmarking comes from activities started later in the 15th century when producers were required to bring their items to the ‘Goldsmiths Hall’ for ‘Marking’ hence the term ‘Hallmarking’. Since these times there have been many changes to the requirements for Hallmarking but the current practice of Hallmarking is carried out under the UK Hallmarking Act 1973. This article describes information related to the UK Gold Hallmark and UK Hallmarking related to gold only. In the UK, the presence of a full UK gold hallmark with all its mandatory Hallmarking components (see below) gives the UK consumer a guarantee that the item bearing the UK Gold Hallmark, having undergone Hallmarking at one of the UK’s 4 assay offices will contain as a minimum, the amount of gold depicted in the UK Gold Hallmark that in bears. For example, an item having undergone hallmarking which within the mandatory Gold Hallmark contains the number ’375′ will be guaranteed to be at least 9ct gold, or in other words at least 37.5% of the total weight will be gold. The remainder made up of the other metals alloyed within the item. 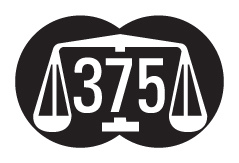 Be aware that although an item may contain a number ’375′ within a marking, unless the complete set of 3 mandatory marks are complete within the gold Hallmark this will not constitute a full UK gold Hallmark, will have not undergone Hallmarking and thereby there will be no guarantee of the quality of the gold. It is important also to note that Hallmarking undertaken outside of the UK may not have been required to comply with the same standards of the UK Gold Hallmark, and therefore may not guarantee a minimum quality. In the USA for example, items of jewellery submitted for Hallmarking under the American system prior to 1978 could legally be hallmarked as 14 carat providing they were at least 13.5 carat. These items would have been rejected under the UK Gold Hallmark system. What does a Full UK Gold Hallmark look like? Under the UK Hallmarking Act 1973 items that have undergone hallmarking with the UK Gold Hallmark must carry all 3 of the mandatory UK Gold Hallmark symbols and may also carry one or two optional markings. As an alternative to the UK Gold Hallmark, Convention Hallmarking can be undertaken and is explained below. This part of the UK Gold Hallmark identifies the maker (or sponsor) of the piece. This will carry a minimum of 2 letters within the surrounds of a shield. Each Sponsors mark is unique to the maker. Fineness is a term used to describe the purity of an item in parts per thousand. 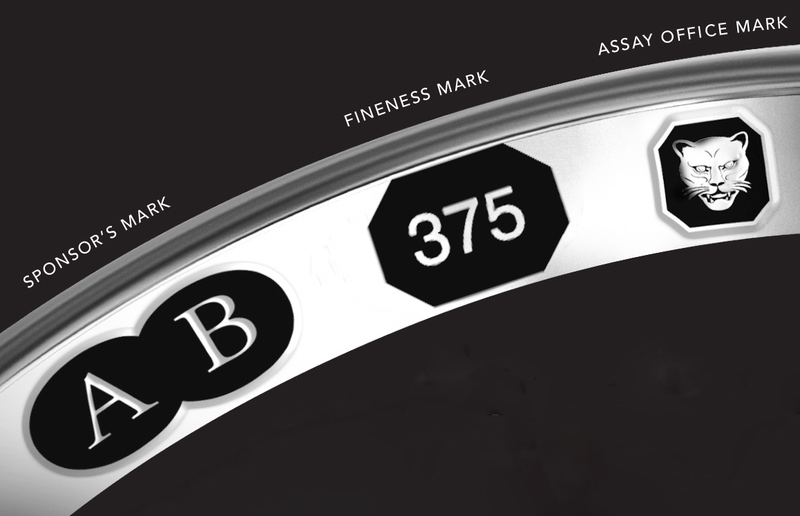 This is the recognised measure of purity under UK Hallmarking.Hersis displayed the purity marks applied to a UK Gold Hallmark for items that have undergone Hallmarking under the UK system. The shape of the mark denotes that the metal is gold. The final mark of the 3 mandatory UK Gold Hallmark components identifies which registered UK assay office the item was tested and marked by. There are only four registered UK assay offices which are allowed to undertake Hallmarking and their Assay Office mark can be seen here. There are an additional two marks that can be applied to the UK Gold Hallmark. The first seen on the left here is the ‘Traditional Fineness Mark’, which identifies the type of metals, and the second seen below is the ‘Date Letter’, showing the year of manufacture. In 1972 the UK became a signatory to the International Convention on Hallmarks, and is therefore the UK’s 4 assay offices are allowed to apply the convention hallmark as an alternative to the UK Gold Hallmark. Once the Convention Hallmark has been applied by any member country these items are legally recognised in the UK and do not have to undergo re-hallmarking with a UK Gold Hallmark. The convention hallmarking must contain the Sponsor Mark, the Common Control Mark, the Fineness Mark and the Assay Office Mark. - Supply or offer to supply an article without a UK Gold Hallmark (or convention hallmark) to which such a description is applied. - Rings, except wedding rings, pencil cases, lockets, watch chains and thimbles. - Articles consisting entirely of filigree work. are set and jointed sleeper earrings. The UK Hallmarking Act 1973 also extends beyond the UK Gold Hallmark into other precious metals including Silver, Platinum & Palladium. These items must also carry the 3 mandatory hallmarking marks of Sponsor, Metal & Fineness and Assay Office, but are subject to varying exemptions. Below is the dealers notice as produced by the British Hallmarking Council which provides all the information you need in relation to the UK Gold Hallmark, other UK precious Metal Hallmarking and Convention Hallmarking. 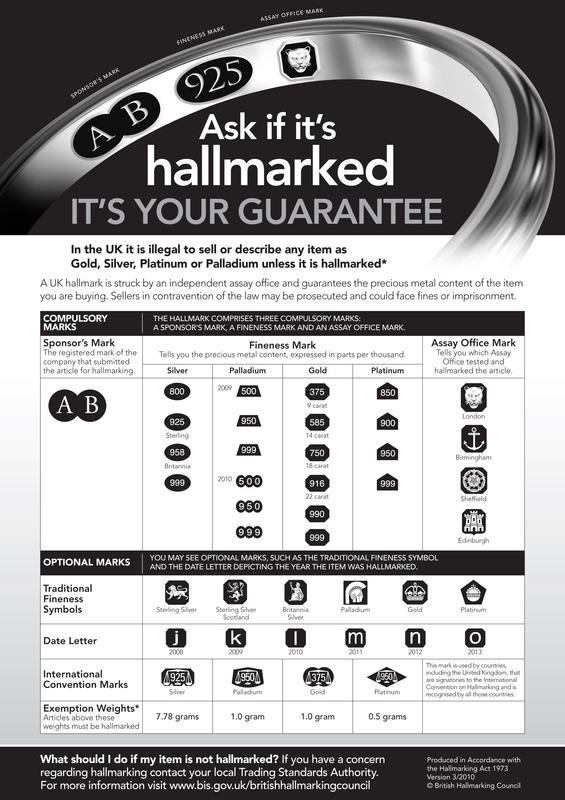 Do you have any questions about Hallmarking or the UK Gold Hallmark please leave your comments in the box below. Back in October Hatton Garden Metals brought you a special offer on all premium 1oz gold coins which ran for a limited period only. Due to the success of our 1oz gold coins special offer, we’ve been working hard to see if we can run this special price again. Today we’re pleased to announce that not only are we able to republish the offer, but are now in a position to drop our price on premium 1oz gold coins forever! This price drop includes all of our 1oz gold coins. For more information on which coins and how you can stay in touch with new stock arrivals read on……. Having already developed a reputation for market leading prices and outstanding customer service, we have continued to work hard to ensure that you always receive the best possible prices from us. Currently Hatton Garden Metals are already able to bring you 1oz gold coins such as the South African Krugerrand at an unrivaled premium of 3% over the London Gold Fix. We are also often able to offer discounts available for bulk purchases. 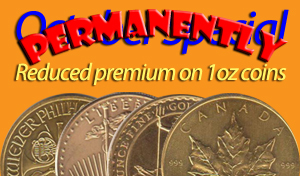 Due to our market position we are now able to reduce our premiums on all other 1oz gold coins from 4% to 3%, making our most popular gold coins now even more attractive as an investment offer.1oz gold coins included in this price reduction will be Canadian Maple Leafs, Austrian Philharmonics, American Eagles, American Buffalos’ Australian Nuggets and the stunning rarely available Chinese Pandas. Not only do we offer outstanding prices when we sell our 1oz gold coins, we also offer the market leading price when buying 1oz gold coins from you. At 100% of the London gold fix our price on 1oz gold coins remains the best in the market to our knowledge for 1oz gold coins and enables you to trade physical gold coins at a spread of just 3%. Do you want to be the first to know about our special offers on gold coins before stock is seen by most of our customers? We have a number of innovative ways to alert you when our 1oz gold coins or other bullion products are made available for purchase. Our RSS feed is setup to send an alert detailing which new products are available to purchase as they are added throughout the day. We also have a number of other RSS feeds that automatically deliver the daily metal fixes, or the latest news from Hatton Garden Metals. Visit our RSS page to find out more or subscribe to receive the latest info. Our RSS feed also delivers stock updates directly to Twitter through our investment gold Twitter feed. Please feel free to send us a tweet to ask any questions that you may have, leave comments on our service, or just tweet us to say Hi! Our investment gold news is delivered straight to your Inbox by joining our mailing list, including latest news, offers on gold coins and updates. On the 11th December 2012 the Royal Mint launched details of its new service offering ‘The Royal Mint Vault’ at their original home the Tower of London. A small number of attendees were invited to the exclusive launch event at the New Amouries, where they gathered to witness a presentation introducing both the Royal Mint Vault service and also changes to 2013 Gold Britannia coin. 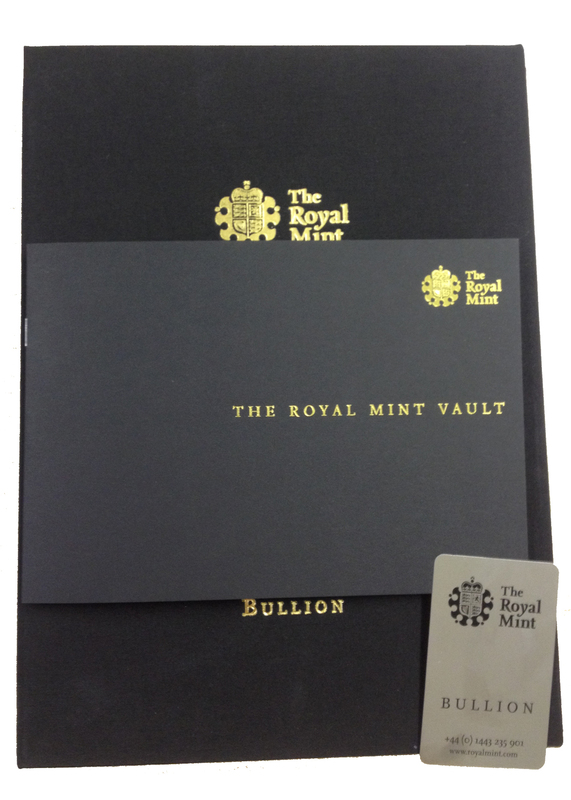 The Royal Mint Vault service offers ‘discreet bullion storage in one of the most secure locations in the UK’. The Royal Mint Vault also offers ‘the facility to own and store gold bullion privately and securely within the Royal Mint Vault. The Royal Mint Vault resides behind the gates of a secured facility, guarded 24/7, 365 days a year by the Ministry of Defense, offering unrivaled security and a service promising absolute confidence and discretion’. Coins purchased for storage at the Royal Mint Vault are done so on a ‘fully allocated’ basis, meaning that individual coins are owned privately by the individual with the option to remove these bullion coins and take a delivery of the physical gold owned. Each purchase is accompanied by a certificate guaranteeing ownership for coins that the individual has bought to be stored in the Royal Mint Vault. Also offered is a ‘buy back’ service for new gold coins bought and stored in the Royal Mint Vault, giving customers the flexibility to be able to liquidise their asset on request. As well as gold bullion coins purchased from the Royal Mint, customers can also elect to have their LBMA Good Delivery bars stored at the Royal Mint Vault. At the time of writing this service has not been launched but we expect this to be available at the Royal Mint Vault from early 2013. Hatton Garden Metals are an authorised stockists of Royal Mint products and as such can supply the 2013 Gold Britannia and the 2013 Gold Sovereign as well as other products in the Royal Mint portfolio (subject to vailability and minimum order level). These coins have the benefit of being exempt from Capital Gains Tax and VAT due to their status as legal tender. 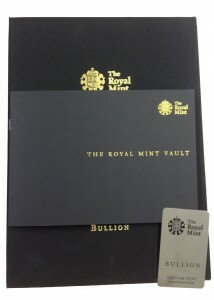 We are currently awaiting further details and pricing of the new Royal Mint Vault service offering and will look at the possibility of offering services based on this later in 2013. For further details about the Royal Mint Vault service, or any other services from the Royal Mint please feel free to contact us where we will do our utmost to be of assistance. For October only 1oz gold coins running in the reduced premium offer will be Canadian Maple Leafs, Austrian Philharmonics, American Eagles, American Buffalos’ Australian Nuggets and the stunning rarely available Chinese Pandas. This offer will run in conjunction with any other gold coin offers we have running at the same time. Other offers available at the time of writing include our ‘Bulk Buy Krugerrand 1oz Gold Coins Special’ as well as an offer we have on some beautiful Silver Philharmonics. Unlike our October 1oz Gold Coins special our Krugerrand and Silver Philharmonics are limited to stock that we currently have available. When they’re gone, they’re gone. 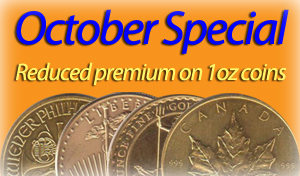 Current stock of 1oz gold coins and special offers can be found here.